^ Realistic goals are based on our past and are limited by our experiences; logical goals are based on what can be done based on time, capacity, and commitment. ^ Make it important and it will be important: Goal setting is a benefit. Everyone agrees, yet most of us keep talking about it and don’t do it, so just do it! ^ We believe our kids can be anything they want to be in life and yet we think we can’t change careers or be number one in business because we haven’t done it before. Whom are we lying to? 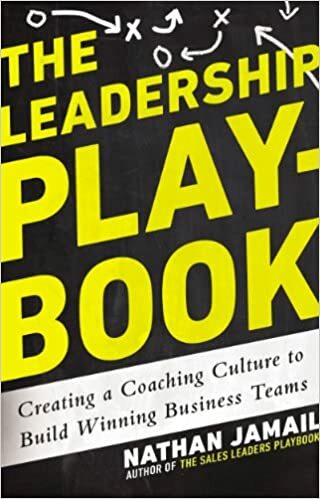 The Leadership Playbook: Creating a Coaching Culture to Build Winning Business Teams is now available at your library. There are enormous differences between managing and coaching. Yet many companies and organizations encourage their leaders to coach teams without ever teaching them how and without creating a culture that supports coaching. Combining research, interviews, and inspiring stories with the lessons that have earned Jamail the respect of the world’s foremost corporations including CISCO, FedEx, Sprint, the U.S. Army, and State Farm; The Leadership Playbook will dominate the category for years to come.